Awoke early this morning to get ready for an 0830 start. 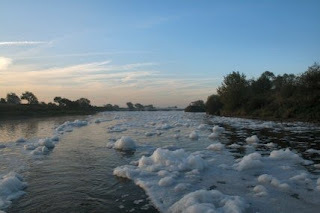 When I looked out of the window I couldn’t see the other bank of the Trent. The cold morning air and the warm of the Trent combined to make a thick mist that covered all. Ten minutes before time the light went from red to green and I cast off. 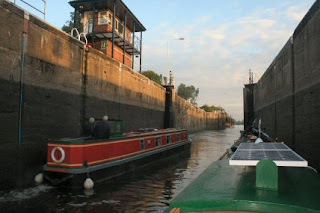 Another boat came down from Newark and so I shared the lock with the Pride of Holderness. Even with two boats in the lock we were not taking up a lot of room. 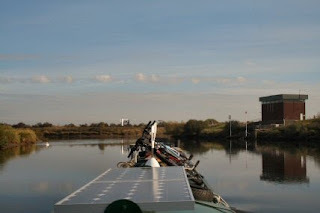 The lock gates open and out in to the tidal Trent. This morning it seems that an awful lot of people had dumped shampoo into the drain. For the next thirty minutes I was travelling through soap suds. The Pride soon disappeared as they travelled at higher speed than I was comfortable with. I think they must be on their way to Keadby. The river level is very low seeing as it was a high tide. On several occasions as I rounded a bend in the middle of the waterway I could see the bottom and took evasive action to take me off into deeper water. Three hours later with the engine still behaving impeccably while running and sounding just fine I reached the entrance to Torksey. 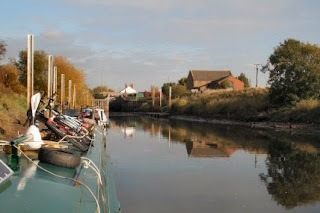 Its left to Keadby and right to Torksey. This time it is right turn for me. The tide being at its lowest it was not possible to get into the lock. By 1300 there were another two more boats on the mooring. One waiting for the tide tomorrow and move on and the other to enter the canal. By 1800 I am comfortably moored next to the water point ready for tomorrow to fill up and move on to Saxilby. As you were going through the soap suds, wasn't it the best opportunity to do your washing free? Ann.